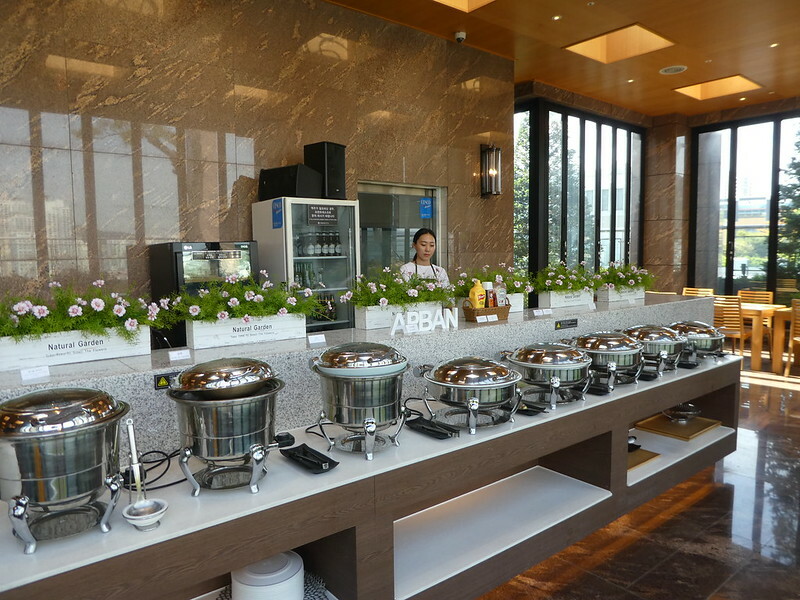 The hotel’s breakfast selection varied from day to day and this morning we started the day with bowls of beef bulgogi, yogurt and fruit. Feeling nourished we set off for the Gamcheon Cultural Village. To get there we took a Line 1 train from Seomyeon station. We then caught a local minibus from outside the National University Hospital, buses 1-1, 2 and 2-2 all go there with the journey taking about 10 minutes up a steep hill. 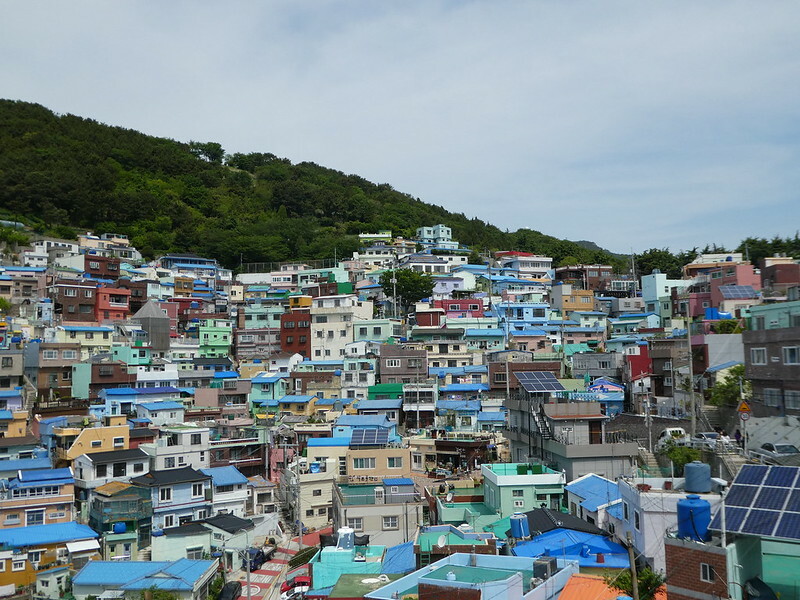 The Gamcheon Culture Village is nestled into a steep hillside and was once a dilapidated slum neighbourhood that housed refugees following the Korean War. 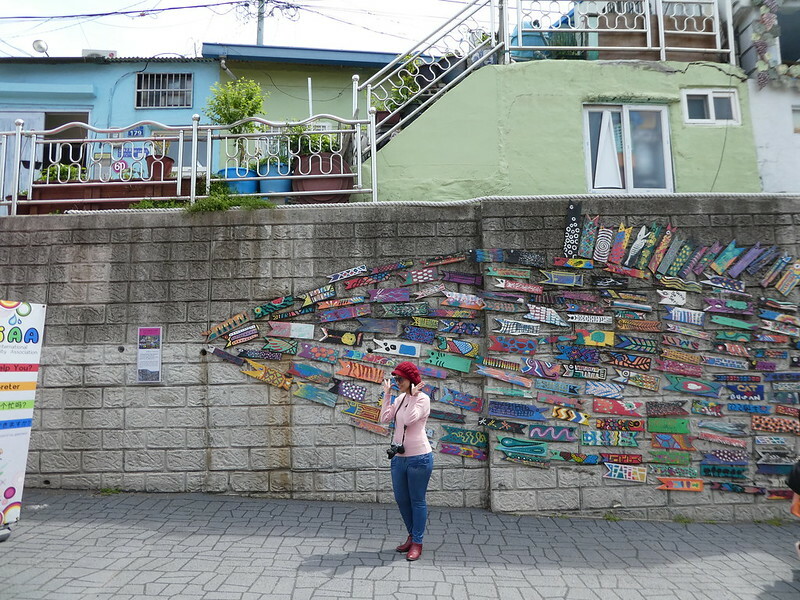 In 2009 the village was transformed when the Korean Ministry of Culture, Sports and Tourism launched an initiative to turn the area into a creative community. Artists were invited to come and brighten up the village by adding vibrant murals to the walls and painting the flat roofed houses in pastel shades. An archway marks the entrance to the village and near there we spotted the tourist information office so called in for a map of the village but as these cost 2,000 Won (£1.40) we decided to manage without one. We soon discovered that the maps were unnecessary as arrows pointed the way though the village. As it was a Saturday morning the narrow lanes were already crowded with tourists. Like us, people were pausing to take photos of the street art and murals and admire the hillside views from the viewpoints. Escaping the crowds, we left the main route and found a way down the hill through the labyrinth of tiny alleyways. The village is still a residential area and visitors are requested to respect the homeowners privacy whilst exploring the area. We caught a a No.1 minibus which we thought would take us back to Toseong station but actually terminated just a short distance up the hill back at the cultural village entrance where we had got off earlier. We hadn’t realised the significance of a 1-1 bus which obviously followed a different route to a No.1. It wan’t really much of a problem as the extra bus fare was only about 80p and soon afterwards we boarded the correct minibus back to Toseong station. The bus stops around the corner from the station so passengers need to look out for the hospital on the left and then ring the bell. 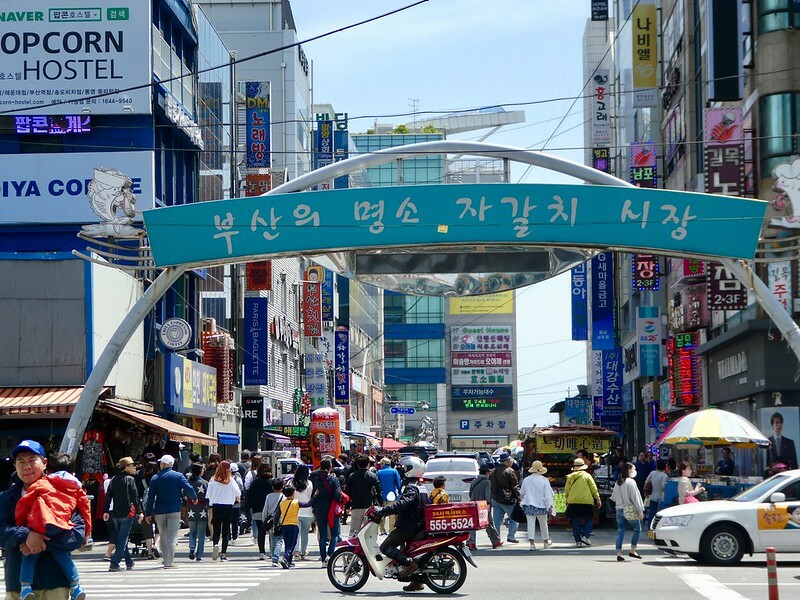 We then took the metro two stops to Nampo so that we could visit Yongdusan Park, leaving by exit 7 and then turning right onto Gwangbok-dong shopping street. After walking five minutes we came to the arched entrance to the park which is via a series of escalators, making it quick and easy to ascend the hillside. 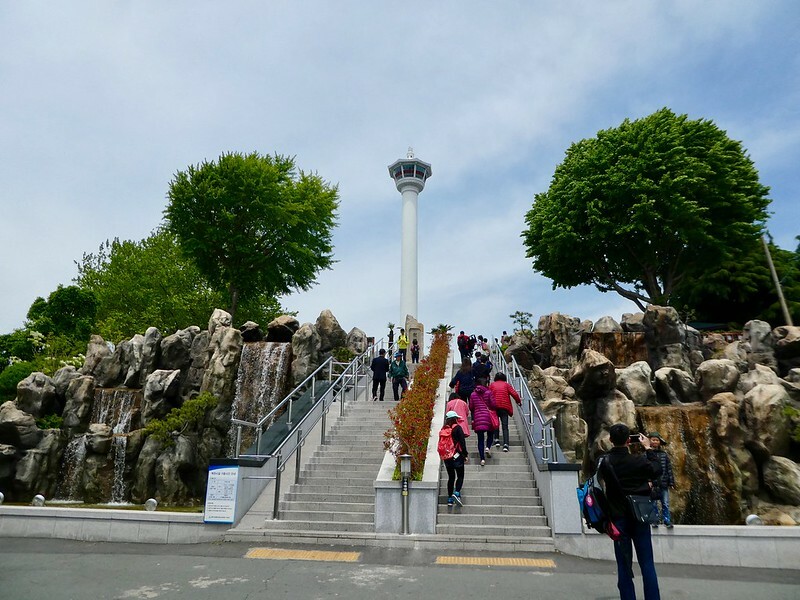 Reaching the top of the flight of escalators we explored the park which contains a flower clock, bell tower, pavilion, several monuments and is dominated by Busan Tower which stands 120m tall. 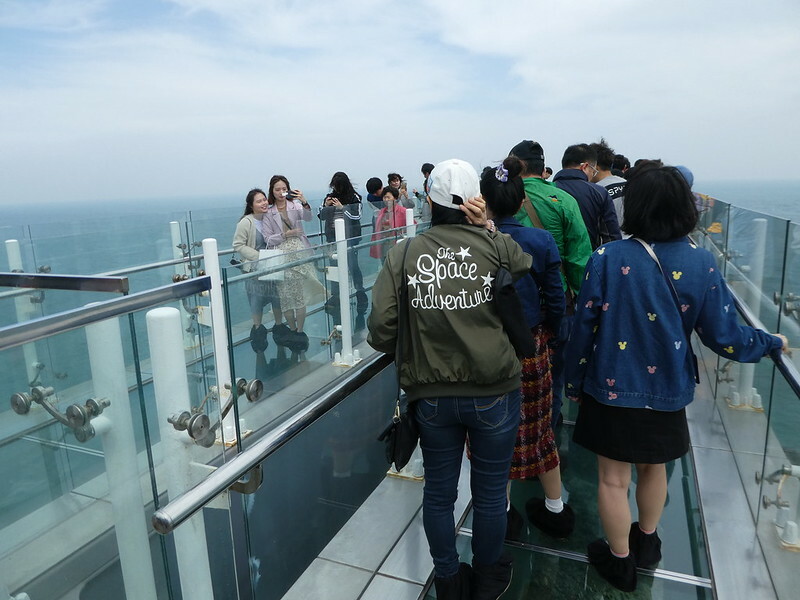 The tower was constructed in 1973 solely for entertainment purposes and contains an observation deck, gift shop and cafe. Yongdusan Park takes its name from the dragon like shape of the mountain, Yongdusan meaning dragon in Korean. 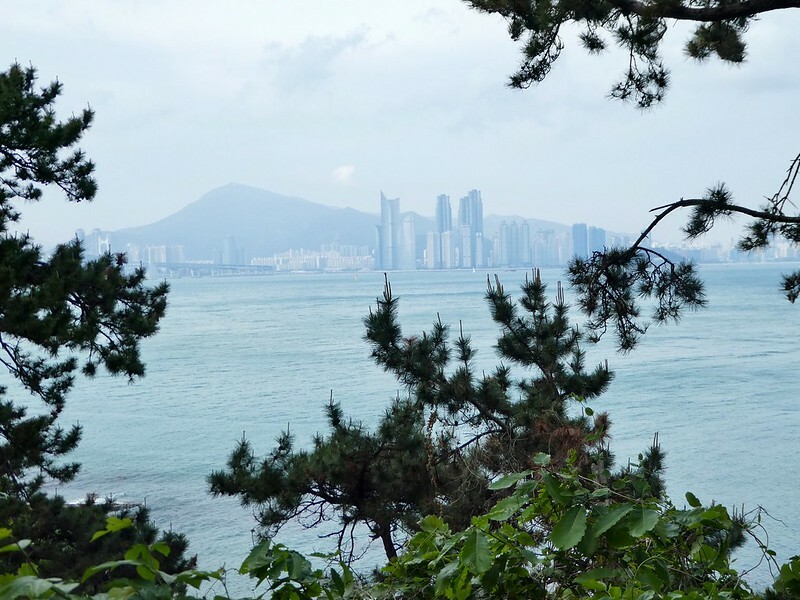 The park contains 70 different species of trees making it a shady place to sit and admire the spectacular views across Busan bay. 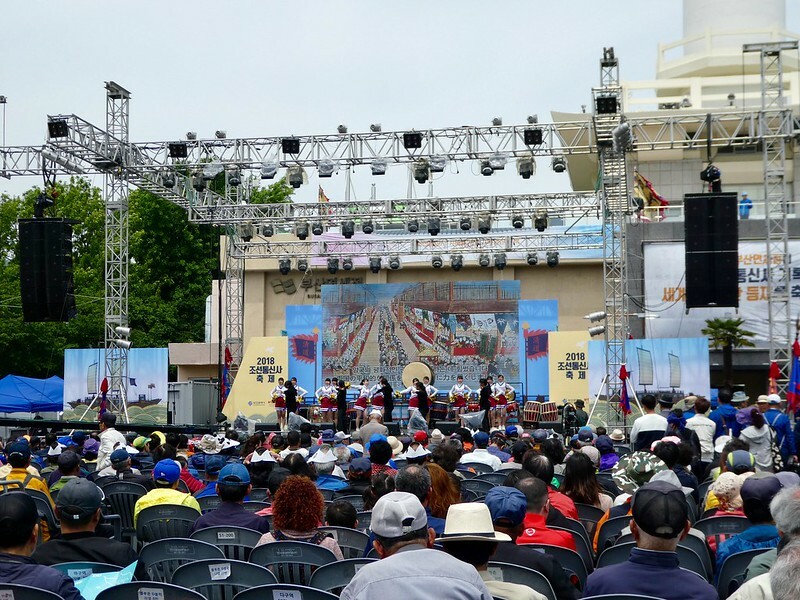 The park holds festivals each Saturday between March and November and a Japanese-Korean festival was in full swing during our visit so we took a seat to watch one of the folk music and dancing performances. Around the foot of Busan Tower several stalls were offering face painting, art classes and games, and after trying my luck on the roulette wheel I came away with a vivid red silk bow tie decorated with Japanese images. I accepted the prize gracefully but am not sure how useful it will be apart from acting as souvenir of my visit to the park. Returning down the escalators to the hustle and bustle of Nampo we couldn’t resist stopping off in BIFF Square and joining the queues for more of the delicious Hotteok sweet Korean pancakes that we tried the previous day. 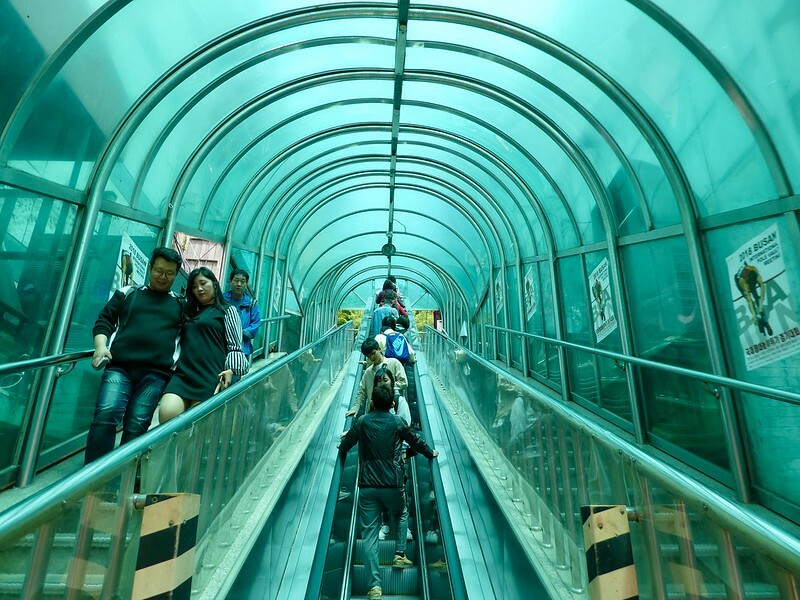 It was then off to the Jagalchi metro station to begin our journey to the Oryukdo Skywalk. 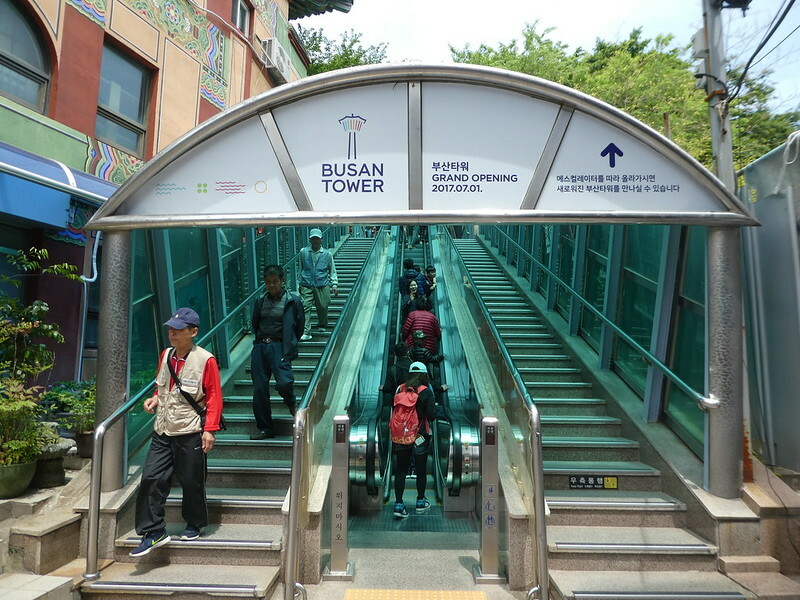 First we needed to take a train back to the Seomyeon interchange station and change lines for Doeyeon. Outside the metro station it took slightly longer than expected to find the No.27 bus stop we needed so I would suggest taking the metro to Kyungsung University and Pukyong National University station exits 3 or 5 where bus numbers 24/27/131 all depart from outside the station for the Skywalk. The bus stop is on the cliff side and from there it was only a few minutes walk to the Skywalk. 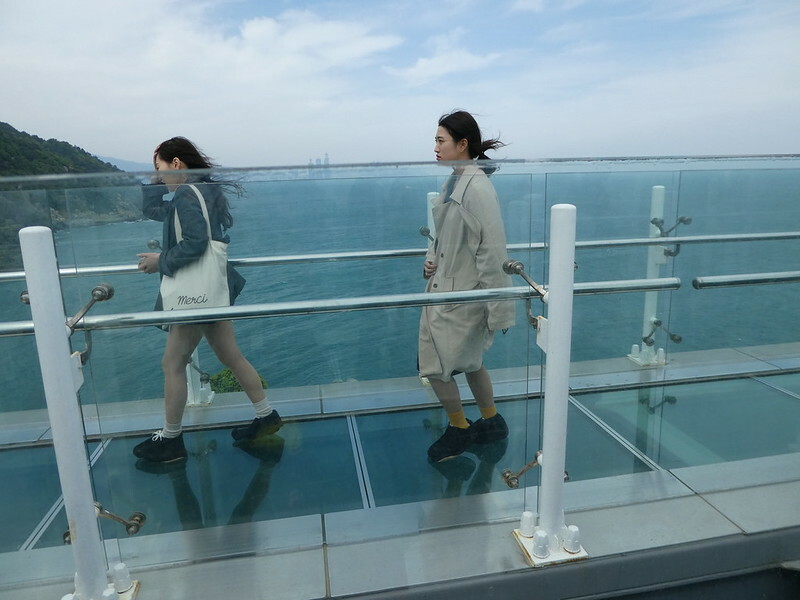 The 15 metre horseshoe shaped glass walkway was completed in 2012 and has been built over a 35 metre high cliff. Quite a queue had built up as we approached but this moved swiftly and it was only a few minutes later that we were putting disposable overshoes on in preparation for stepping on the glass. There is no charge to access the Skywalk and although it was interesting to peer down through the glass floor and see the waves crashing against the rocks below, it only took about five minutes and was somewhat underwhelming . 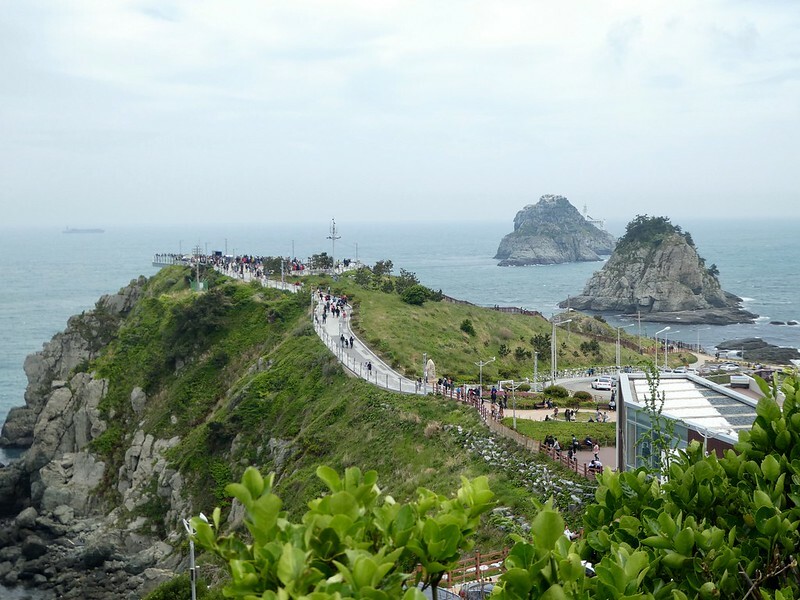 Starting from the tourist information office across the road from the Skywalk is the Igidae Coastal Walk, a 4.5 km path around the peninsula. The trail began with a steep upward climb but we anticipated that once we had reached the cliff top it would be a reasonably level walk along the cliffs. As we progressed, it soon became apparent that the walking trail was quite strenuous with constant steep ascents and declines as the path followed the natural terrain. 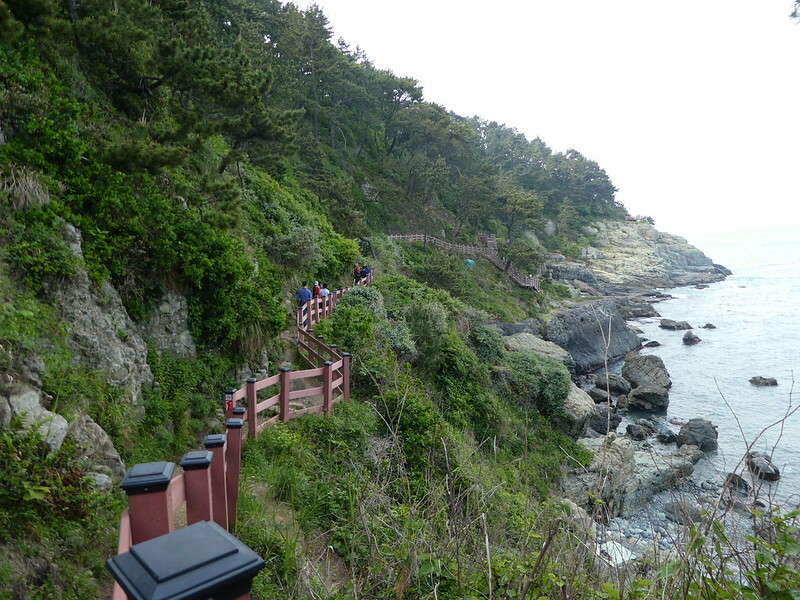 The trail passed across wooden suspension bridges and along gravel paths, with small viewpoints at regular intervals offering breathtaking views along the coast. It took longer to complete the trail than we had at first thought as it was quite challenging in places with rock scrambles but it was worth completing for the breathtaking views and stunning scenery. After leaving the trail we walked down the main road just outside the northern end of the park entrance and caught a No.24 bus all the way back to Seomyeon near to our hotel. We then rested our feet awhile before raising the energy to go out for dinner. Nice views, and cool sky walk! Thank you, the Sky Walk was really nice! I have wanted to comment, but suffer terminal laziness. 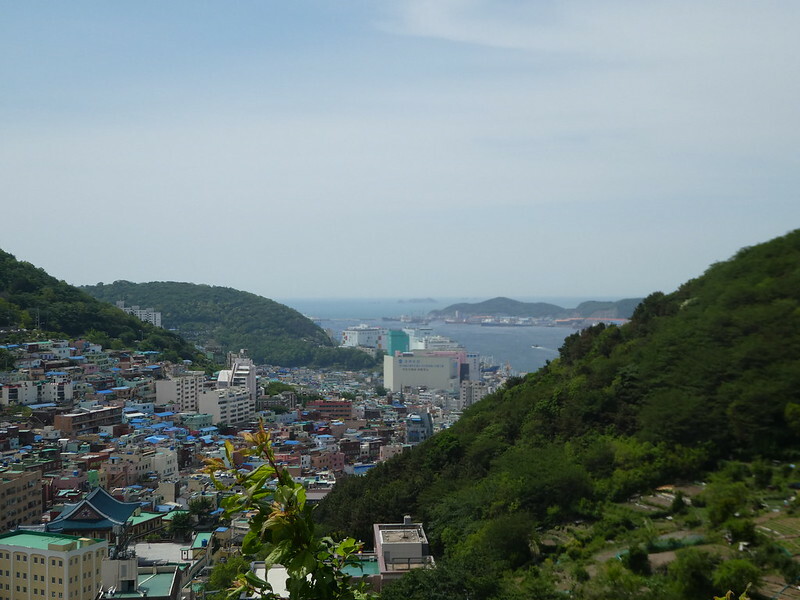 I enjoy your posts of places I have been (like Gamcheon) and places that are off in the future. Your conciseness in explaining how to get around is truly prize-worthy. I try to check your blog first before we head on to another destination. It saves so much time. Thanks. Thank you so much for your kind words, it is really lovely to read that my posts bring back happy memories for you of places you have already visited and help you with planning new destinations. Best Wishes. Thanks Jason, I do appreciate you spending the time catching up on my travels. Hope you get an opportunity to visit Korea one day, too! I think you’re beginning to catch the inspiration Northern Asia brings. The beauty of the landscape, the industry and intelligence of the people and depth of culture. I’m sure you’ll return again. Thanks Ian, I do hope that I have an opportunity to return to South Korea before too long as everything you say about it, is true. Such a lovely beautiful inspiring post. Keep Posting. Thank you for your inspiring thoughts, they are much appreciated. For reasons I cannot explain Korea has not been high on my destination list. Good information and I think I will have to pay more attention to Korea going forward. Thanks. Thank you for taking an interest in my series of posts on a Korea. Hopefully you might be inspired to travel there one day. Thank you Carlo for your kind words. I’m glad to read you enjoyed this post and it’s photos. 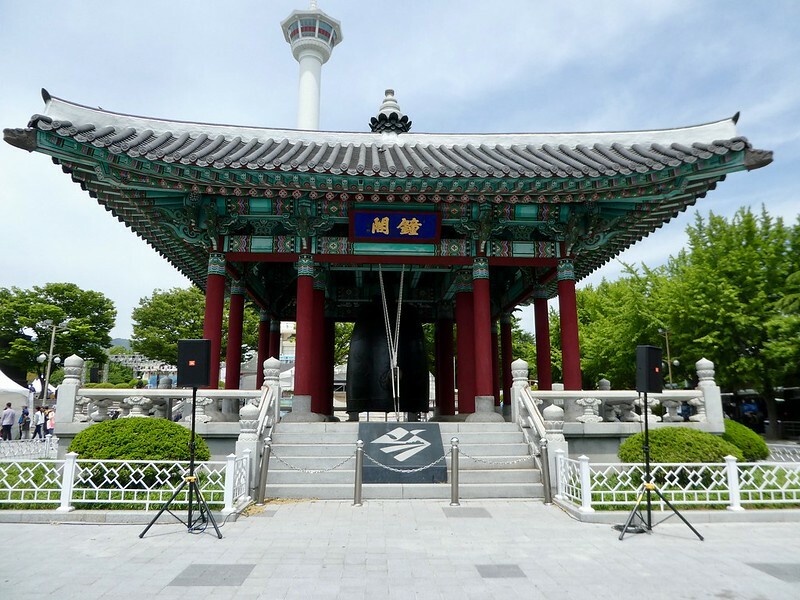 Stunning picture of the Bell Tower in Yongdusan Park! that coastal trail looks tempting! Wonderful! Thank you Sandra, it was lovely. Your photos are stunning in their beauty. Hotel breakfast room was very nice looking. I had to stare many times at the photo of bell tower, but I could not find anything which could bring into my mind that is was bell tower. Thank You for this interesting post again. Thank you for your kind words Matti. The South Korean bell towers are very different to those we are used to in Europe. Here, it s one giant sized bell housed in temple like structures. We enjoyed a splendid visit to South Korea. Your photos are so clear and inviting. Another full day, Marion! 🙂 🙂 I admire the initiative to transform those slums. I could have enjoyed spending time there. The views out to sea are striking but you can’t help but notice how crowded are the valleys. I like the sultry warmth in your photos. Thank you for your ever welcome thoughts on this post Jo. The scenery along the south east coast is stunning. Thank you, I’m certain you would enjoy it! That skywalk and coastal walk looks amazing, and the place itself looks like a wonderful cultural and art center 🙂 Lovely pictures as always! Thank you for your kind words. The coastal path is stunning along that coast. Yongdusan Park was the first place we took our then 15-month-old, when we first visited Busan, in 1989, as he was born in the Year of the Dragon-1988. Now, he is 30, living in Busan and visits Yongdusan fairly often, with his lovely fiancee. Wha fond memories that Yongdusan Park holds for your family. It’s so nice to read this, especially as my older son was also born the same year!